Because of the rarity of the intumescent cataract in the USA, a few classic examples operated on by Dr. Caccamise are presented for viewers of the Atlas. This stage of cataract potentially lies between the immature cortical cataract and the mature corticonuclear cataract. It is a stage that is usually by-passed in the history of a cataract 1. incipient to immature, 2. intumescent, 3. mature corticonuclear, 4.hypermature Morgagnian, 5. shrunken Morgagnian. In the USA, most cataract surgery is being performed on very immature cataracts, i.e. cortical; posterior subcapsular; nuclear ; corticonuclear. Many of the lenses have a considerable amount of non-cataractous lens structure present at the time of surgery. Contrariwise, most lens extractions in India involve patients who are industrially (20/80 or less) but more often legally (20/200 or less) blind. Except for cases of posterior subcapsular cataract, most patients have surgery when very little of the lens remains free of cataract changes. 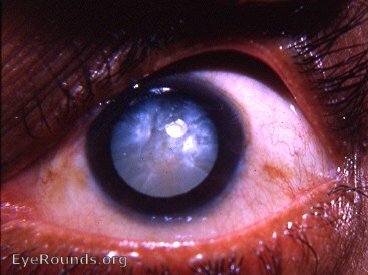 This is the classic intumescent cataract. 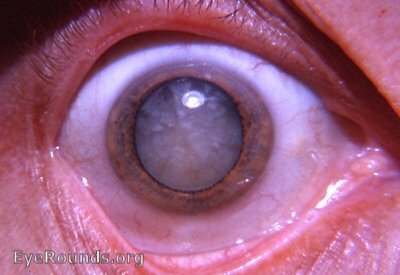 If the pupil is not dilated, the differential diagnosis of a white cataract may not be accurate. With dilation of the pupil, there should be no difficulty in distinguishing an intumescent cataract from a Morgagnian cataract. The intracapsular cataract surgeon recognized this as having the most friable of anterior capsules. Many patients who came to the Kurji Holy Family Hospital Eye Clinic were described as having " two headlights in their eyes " - a pure white pupil in each eye. The differential lay between the more frequent hypermature Morgagnian cataract and the less frequent intumescent cataract. The intumescent cataract has prominent sectorial markings in the anterior cortex. The hypermature Morgagnian cataract has absolutely no sectorial markings in its completely liquefied anterior cortex. It should be mentioned that many patients presented with a dirty-white pupil. That usually meant a mature senile catarct. 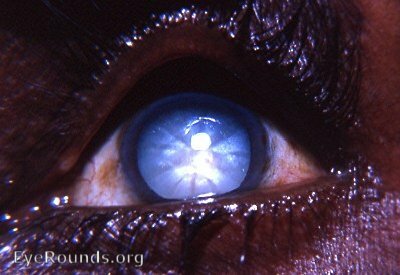 A pure-black pupil due to cataract suggested a nuclear cataract. In India, the cataracta nigra was occasionally seen. 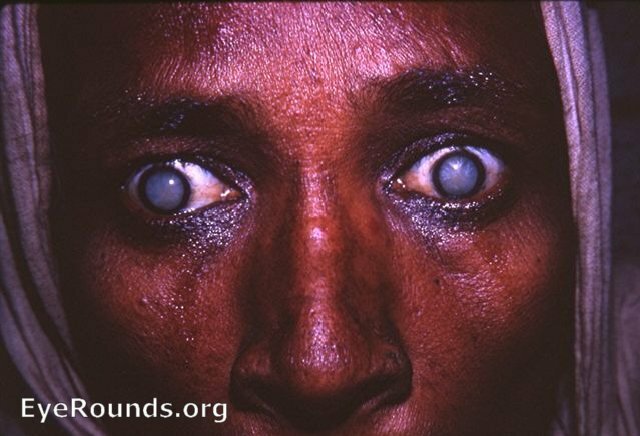 Before the use of the slit-lamp the cataracta nigra was frequently not recognized as the cause of the patient's blindness - the pupil appeared to be normally black. 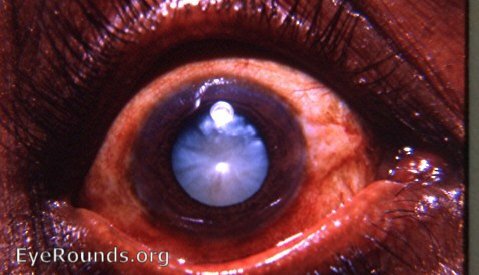 Compare the various cataract photos in this Atlas for good examples of both cataracts. In native-born Americans the latter cataract is nearly non-existent. The intumescent stage of the senile cataract is seen rarely in the USA. 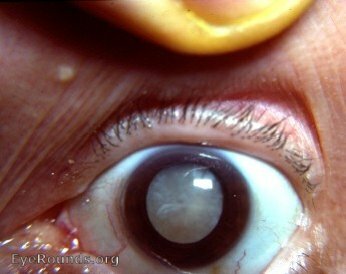 In the era of the intracapsular cataract extraction (pre-phacoemulsification), the experienced cataract surgeon evaluated each cataract for the potential fragility of its anterior capsule. In Dr. Caccamise's experience, the intumescent cataract was the most difficult to remove without rupturing the capsule. At times the lens would seem to rupture without any evident provocation. A silvery, mother- of- pearl flaky cortex would fill the anterior chamber. An extracapsular cataract extraction would be the result. In the era prior to Kelman's introduction of phacoemulsification and a return to extracapsular cataract surgery, great emphasis was placed on the differential diagnosis of the various stages of cataract. It was an unpleasant day for the surgeon when a planned intracapsular procedure turned into an inadvertent extracapsular cataract extraction. During Dr. Caccamise's experience at the Kurji Holy Family Hospital Eye Clinic (1951 through 1968 with 15 to 20 cataract operations daily except on Sunday) an emphasis was placed on intracapsular cataract surgery - using either the Smith-Indian technique or the Bell microerisiphake. It was found that the intumescent cataract was the most difficult so-called senile cataract to remove wihout rupturing the capsule - next was the classic hypermature Morgagnian cataract (" a bag filled with milk containing a loose dark brown nucleus "), followed by the cataracta nigra, and then the immature corticonuclear/posterior subcapsular cataract.With subsequent photographs the hypermature Morgagnian cataract will be presented and discussed in greater detail. Notice the details of this female's left cataract. There are sectorial markings that are pathognomonic in differentiatng the intumescent cataract from the classic swollen hypermature Morgagnian cataract (in some later photograph, there will be a discussion of the extremely rare shrunken hypermature cataract - an entirely different and more formidable matter). The intumescent cataract represents a potential stage between the immature cortical/corticonuclear cataract and the mature corticonuclear cataract. There is a sudden dramatic change- sometimes within a few days - in the previously immature cortical cataract so that the intumescent cataract appears as in this patient. This is not to be confused with cataracta complicata which has a similar appearance and demonstrates a similar fragility of the anterior capsule during attempted intracapsular surgery. 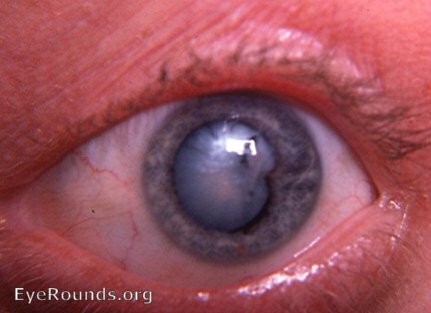 The present use of " white cataract " as a blanket term for the various stages of cataract that a " white pupil " may represent leaves much to be desired. It should be emphasized that the intumescent stage is rarely part of the usual historical development of cataracts that the surgeon will face in surgery. at times the intumescent cataract will produce a very shallow anterior chamber. Intumescent stage of a traumatic cataract with a persistent posterior synechia at 3 o'clock. There are pigment remnants on the anterior lens capsule. These represent the points from which other posterior synechiae tore loose under the influence of mydriatic and cycloplegic drops that were used to dilate the pupil. In this patient, traumatic iridocyclitis led to formation of synchiae. Medical dilation of the pupil freed the synechial formations except that remaining at 3 o'clock. The pigment clumps still attached to the anterior capsule of the lens represent the sites of broken synechiae. This is the epitome of an intumescent cataract - mother of pearl appearance with sectorial markings.This eye has reacted to iris surface changes by forming an extensive ectropion uveae. 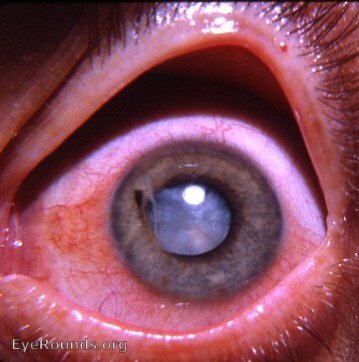 In addition, a sheet of the ectropic pigment has torn loose from its iris attachment - schisis of the ectropic pigment epithelium that ha been pulled over the pupil margin onto the anterior surface of the iris. Slit-lamp examination reveals neovascularization of the anterior iris surface - one explanation for the production of the ectropion uveae.